RB812 Features: -Floor not necessary with this kit. -Hardware with screws, latch and hinges included. Material: -Wood. Color: -Natural wood. Shape: -Rectangular. Water Resistant: -Yes. Rot Resistant: -Yes. Material Details: -Western red cedar. 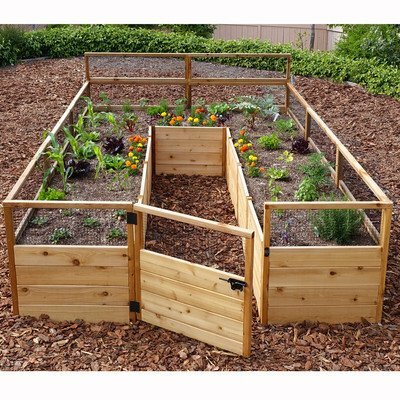 Dimensions: -Panels create 21.5" high growing beds with 12'" high fencing which is backed with wire mesh. -2 Folding trellis panels 46"W x 13" H increase the height of 2 sections to a total height of 47" and can be mounted in rear or on the sides. Overall Height - Top to Bottom: -33.5". Overall Width - Side to Side: -92". Overall Depth - Front to Back: -141". Overall Product Weight: -350 lbs. Warranty: Product Warranty: -In the event of a missing or broken piece, simply call the Outdoor Living Today Customer Support Line at 1-888-658-1658 within 30 days of the delivery of your purchase. It is our commitment to you to courier replacement parts, free of charge, within 10 business days of this notification. Replacement parts will not be provided free of charge after the 30 day grace period.. Exterior dimensions: 92W x 141D x 33.5H in. Interior dimensions:91W x 140D x 32.5H in.